A couple recent paintings today, one exploring new ideas, the other a bit more traditional. This first painting is from a reference photo of Avila Beach, taken during San Luis Obispo Plen Air last year. I was in a cliff looking down. I always liked the abstract qualities of shape and color in this photo, but thought the near top down perspective might be a bit odd. It’s less traditional, which I appreciate as I explore abstraction in my work. I like the simplicity of this, yet I think this study could make an interesting larger work. Color-wise, I think this painting works well because I’ve balanced out warms/cools and color saturation–both from he difference between the rocks vs water. This was painted from a reference photo taken in the Palm Springs area–I believe 1000 Palms, when I took a workshop with Mark Kerckhoff there a couple years ago. Funny how these bits/bytes are the physical reality of the moment, until recreated in oil years later. 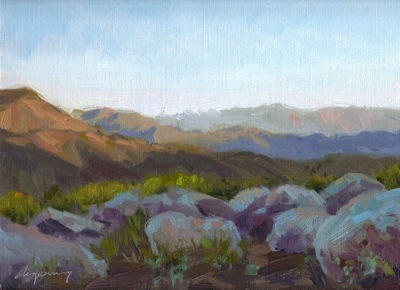 I’m pretty happy with this study, though I wonder if the brush just about the boulders are too saturated and yellow. What do you think?